This webpage invites you to try us out for your English to Turkish translation jobs. We can meet all your needs, whether they are professional or non-professional. For professional English to Turkish translation jobs, we have a panel of proficient translators who, for a reasonable fee, will undertake the task and deliver error-free results in a timely fashion. Ask us for a quote. For simpler informal translation of English to Turkish, we have a basic tool on our page that can be used for free by even a beginner. This English to Turkish translator tool requires the user to input the English text in the box provided before clicking on the ‘Translate’ button given alongside. This will immediately generate the English to Turkish translation of text. Turkish belongs to the Turkic group of languages. Within this group, it is part of the Oghuz subgroup with other sister languages such as Turkmen, Azerbaijani, Uzbek, Uighur, and Qashqai. Turkish itself has many dialects such as Azerbaijani Turkish, Kazakh, Uzbek, Kyrgyz, Tartar, and Yakuti besides a few others too. Therefore, Turkish generally refers to the Istanbul dialect of the language. Some scholars also feel it is linked to Japanese, Korean, and Mongolian too; however, this is most likely due to the give-and-take between the languages and not a similarity per se. . The language is one of the ancient languages of the world that dates back to between 5500 to 8500 years ago. It is the main language of Turkey as well as Cyprus. Most of the approximately 80 million speakers of Turkish are in Southeast Europe and Western Asia. However, quite a few can also be found in countries across the world due to migration. Thus, Turkish speakers have a presence in Canada, Germany, Macedonia, Belgium, Bulgaria, and Central Asia. . There are 29 letters in the Turkish alphabet with 21 consonants and 8 vowels. They are mainly derived from the Latin alphabet. However, some vowels are adapted to suit local pronunciation. Turkish is a phonetic language and thus easy to spell since it is written the way it is pronounced. There are no diphthongs in the alphabet (unless they exist in a word that has been taken from a foreign language). The original Turkish alphabet does not have the letters W, X, and Q. But with the advent and adoption of foreign names and words, these have gradually found their way into the alphabet. .
Turkish written records have been found in Mongolia and date from as far back as 720 to 735. The first Turkic dictionary was compiled in the 11th century. When Islam spread in the region, numerous Persian and Arabic words made their way into the language. 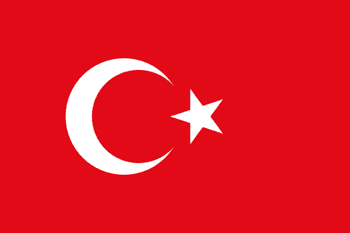 This gave rise to a new form of Turkish that was named the Ottoman Turkish. .
After the creation of the Republic of Turkey in 1923, there was a move to remove most words that were of Arabic or Persian origin from the Turkish language. Old Turkic words that had become defunct were reintroduced into the language and some new ones were coined as well. Some English words too gradually became part of the lexicon. The language continues to be in the process of evolving.